Pizza night gets a makeover! We’ve eliminated gluten and grains and pumped up these delicious thin-crust pizzas with nutrients by using sweet potatoes instead of flour to make the crust. Sweet potatoes are loaded with antioxidants, vitamins and fibre, as well as magnesium, a superstar mineral for de-stressing as it promotes relaxation and a calm mood. 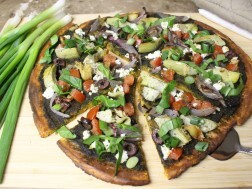 This paleo and grain-free crust is sturdy, filling and can hold all of your favourite pizza toppings making family pizza nights fun and healthier! Line a pizza or baking tray with parchment paper and set aside. Place the cooked sweet potatoes in a medium bowl and mash well. Add eggs and vinegar and incorporate well with a hand masher or mixing spoon. Mix in the coconut flour, baking soda, salt and ground pepper. Pour the sweet potato batter onto the baking tray and spread it out so that the crust is about 1/4 inch thick. Bake for about 30 minutes, until golden in color. Remove from oven. Optional step: once cooked, flip crust onto the baking tray and peel parchment paper off so that the top of the pizza is now the smooth side. Top with your favourite ingredients. Be sure to precook any hard veggies or meat, since the pizza will only bake for about 15 minutes. Once topped, return the pizza back to the oven and cook for 10-15 minutes.